The wearer becomes a beacon for other-dimensional, intangible, subtle forces of good, much in the manner of a superhero. The “sound collages” she recorded onto the tape used in this batch of ties comes from her CD Between Stations, which comprises looped and layered samples captured on (and beneath) the streets of New York City. 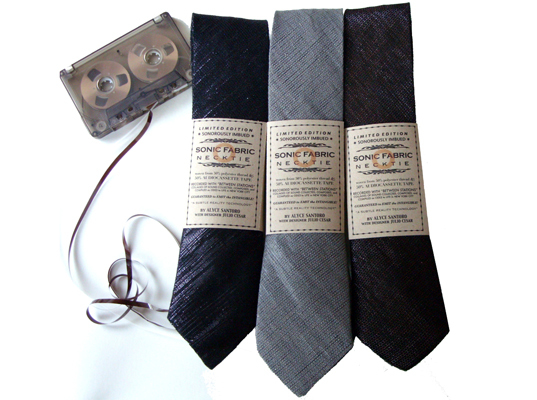 Available in cobalt blue, dark brown (woven with brown tape and black thread), and light gray (gray thread, black tape), these eco-friendly ties can be purchased in your choice of “skinny” or regular-size versions. Cassette tape? How positively antiquarian! Conceptual artist Alyce Santoro brings this data-recording throwback (and mix-tape mainstay) into the 21st century, not only by spinning it into fabric, but also by rendering it "playable" when you run a tape head across its surface. 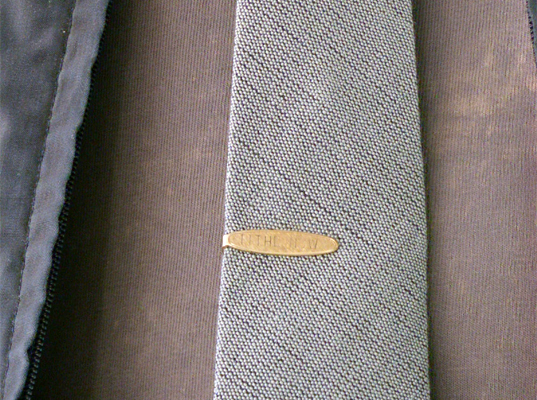 Santoro's limited-edition neckties, made in collaboration with Julio Cesar from 50 percent recorded audio-cassette tape and 50 percent colored polyester, are a testament to Sonic Fabric's versatility�as well as its ability to transform even the stuffiest of suits into what Santoro dubs stealth "superhero garb."